This program serves as a detailed road-map to your real estate success. You'll receive the complete strategy for Link Options in an easy to follow step-by-step format. Nothing is held back and we continually UPDATE everything as we grow our own business and help students establish and grow their business. 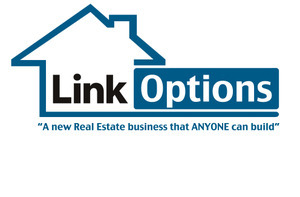 Everything you love about the Link Options Real Estate Training Program on a convenient 8-month payment plan. Content Packed 6-week training series with Wendy Patton and Keith and Shannon French, where we go into DETAIL about our Link Options/Cooperative Options (wholesaling lease options) strategy! You won't believe what you will get with this VERY DETAILED 6-WK training! Just $49! Keith and Shannon French host two calls per month to answer any and all questions about our Link Options real estate investing strategy! You also get exclusive access to our Closed Facebook Group setup to handle ongoing Q&A in between calls for unlimited support. 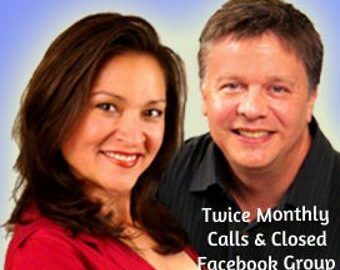 Keith and Shannon French host two calls per month to answer any and all questions that you may have about our Link Options real estate investing strategy! Also, every participant is enrolled into a Closed Facebook Group setup to handle ongoing Q&A. Want your marketing to be more efficient AND more effective? Bandit Sign On Wheels is a proven system that will get you the exposure you need to generate MORE LEADS and land MORE DEALS! 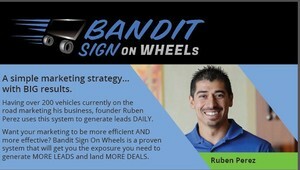 Bandit Sign on Wheels is the easiest way to build an army of Marketers. Ruben’s Proven System will walk you each step of the way; from finding drivers, to finding cash buyers, and closing on your deals.